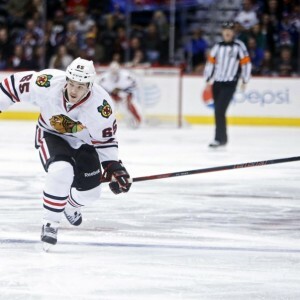 What Will Artemi Panarin Do For an Encore? Russian winger Artemi Panarin first landed on the North American map with a brilliant performance in the 2011 World Junior Hockey Championships, held in Buffalo. Tallying five points in seven games, Panarin helped his Russian squad capture the gold medal against a heavily favoured Canadian team with a five goal comeback in the championship game. In the four following seasons, Panarin emerged as a bonafide KHL star, as he notched 146 points and captured a Gagarin Cup title with SKA St. Petersburg in 2014-2015. His final KHL season was also the year Panarin solidified himself as a future NHL player, as he notched the 5th-most points in the KHL and was named to the KHL First All-Star team. After a strong performance in the annual World Championships with 10 points in 10 games, Panarin had no shortage of suitors when he decided to break his KHL contract and make his move to the NHL as a 23-year-old rookie. Ultimately, Panarin ended up with the Chicago Blackhawks, signing a two-year contract with the two-time Stanley Cup champions in the midst of their third Stanley Cup championship playoff run in six years, citing a desire to play beside Hart Trophy front-runner and offensive dynamo Patrick Kane. 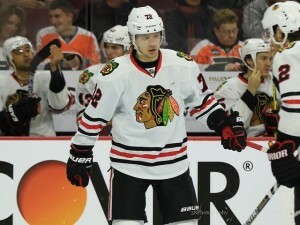 “The Bread Man”, as Panarin is affectionately known as to Blackhawk fans, was immediately thrust into a top-six role upon his arrival in North America, as head coach Joel Quenneville paired the explosive young Russian with former first overall pick Patrick Kane and fellow new acquisition Artem Anisimov. Together, Chicago’s second line raced out of the gate to a flying start, as Kane notched 37 points in just 24 games, while Panarin was able to kick off his career with 23 points in 24 games. For the Blackhawks, who had long struggled to get secondary scoring once they were forced to trade veteran stars such as Andrew Ladd and Michael Frolik, Panarin’s high level production and relatively cheap price tag made him an invaluable asset to the Blackhawks’ offense as one of the top bargains in the entire NHL. In fact, Panarin’s outstanding freshman season in the NHL has him primed to capture the NHL’s Calder Trophy award, the first Blackhawk to receive the award since Mr. Kane himself in 2008. After such a successful rookie season, it’s no surprise that Panarin stands to gain a substantial amount in additional contract bonuses. In fact, Panarin’s rookie excellence has him in position to nearly quadruple his salary from this season. Artemi Panarin has officially locked down $2.575M in performance bonuses. It’ll cost the #blackhawks at least one player next season. The Blackhawks, employing superstars such as Jonathan Toews, Patrick Kane, and Duncan Keith, have long been in a tight situation with the NHL’s upper salary cap limit. Despite winning three championships in the last six years, the increasing salaries of the Blackhawks’ core players has forced them to move several players who have gone on to great things with other organizations, such as Andrew Ladd (who came back to Chicago in a deadline deal this season), Dustin Byfuglien, Michael Frolik, and as recently as last summer, Patrick Sharp. Whatever roster decisions the Blackhawks make this summer, the supporting cast of the Blackhawks’ top scorers is crucial to Panarin’s continued success as a sophomore in the NHL. This summer, the 2015 Stanley Cup winners may have some tough decisions to make with Panarin’s cap hit skyrocketing to $3.5 million dollars next season. With well under $1 million in cap space to work with, GM Stan Bowman has his job cut out for him. Pending restricted free agent Andrew Shaw has developed into somewhat of an emotional leader for the Blackhawks, and one of the NHL’s most infamous “pests”. Coming off of a season where he tallied 34 points and then added six more in the playoffs, Shaw is due a pay raise after he earned $2 million last season. Bowman’s biggest deadline acquisition, the aforementioned Ladd, earned a big contract as former captain of the Winnipeg Jets and is likely to price himself out of Chicago as an unrestricted free agent. The Blackhawks’ defensive depth was also put to the test when Keith went down with an early-season injury, but Bowman has already taken steps towards filling their need on the back-end with the recent signing of Czech defender Michal Kempny. For Bowman, the problem he must solve isn’t what pieces he can add to an already impressive core, but how to move out salary to accommodate the rising salaries of not only Panarin, but also valuable depth forward Marcus Kruger and Panarin’s linemate Artem Anisimov. And if Bowman can find a deal to move out Bryan Bickell’s albatross of a contract, it would go a long way to ensuring Panarin stays in Chicago for many years beyond his current contract’s expiry. The dreaded sophomore slump is inevitably going to be one of the main concerns facing Panarin entering next season. The infamous dip in play associated with second-year players has affected many of the league’s top rookies in recent seasons, as 2013 1st overall pick Nathan Mackinnon, 2013 Calder Trophy winner Jonathan Huberdeau, and many others have failed to live up to expectations in the second year of their fledgling careers. However, Panarin’s level of rookie excellence has, historically, led to sustained and even increased production in subsequent seasons. Since Teemu Selanne’s record-breaking rookie season in 1992-1993, only eight other first year players have ever reached the 70 point plateau, with only six of those players reaching the 30 goal plateau as well. That list of players would make any Chicago fan giddy, as names such as Sidney Crosby, Evgeni Malkin, and Alexander Ovechkin grace the top of that list. Of those eight players, only three failed to improve their points per game average from their first season (two players, Mikael Renberg and Alexei Yashin, played out their second seasons during the NHL’s lockout-shortened 1994-1995 season). However, it should be noted that Panarin, at age 24, is nearly three years older than the next oldest player on that list (Renberg). Considering only eight players reached the point per game mark in the NHL this season, expectations regarding Panarin’s scoring exploits next year must be tempered. Artemi Panarin, the Blackhawks’ prized European import, blew away all expectations placed upon him when he first came to North America last offseason. Despite entering the season as a clear-cut secondary contender for the Calder Trophy behind uber-prospect Connor McDavid, Panarin’s quick transition to the NHL and significant missed time from McDavid combined to make Panarin the Calder favourite by the end of the season. After earning a big salary spike with his impressive numbers this year, the pressure will be on Panarin to ensure that his big rookie season wasn’t a fluke. While the Blackhawks might have to say goodbye to several pending free agents due to Panarin’s (among others) pay bump, GM Stan Bowman has consistently shown that he can ice a competitive and high-scoring team. Playing alongside likely Hart winner Patrick Kane again, Panarin could conceivably make a run at not only matching, but improving his scoring numbers from this year.